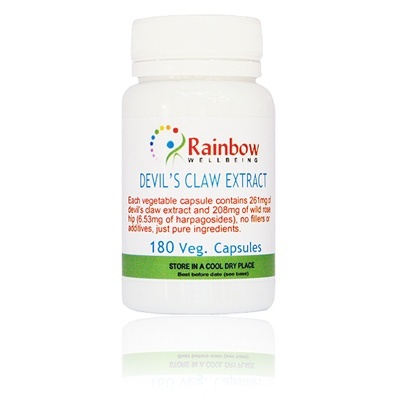 Devil's Claw Extract & Wild Rosehip Veg. Caps. 180 x 470mg Veg. Caps. Devil Claw (Harpagophytum procumbens) is the low key ancient root with remarkable properties. The herb grows in the deserts of the Namibian Steppes and the Kalahari. The roots have several hand like endings with horns, which is why it is called devil claw. Once dried out it is extremely hard and the roots can grip, the plantÃƒÆ’Ã‚Â¢€ÃƒÂ¢Ã¢€Å¾Ã‚Â¢s seeds are found within. It was first introduced in Germany after the first world war, by agricultural pioneer Mr. Mehnert, who studied the therapeutic actions of the herb for 40 years then submitted samples to doctors in university clinics and laboratories where tests and trials were conducted after which it soon gained a reputation for having powerful properties. Each vegetable capsule contains 261.3 mg of devil,s claw extract (6.53mg of Harpagosides) plus 208.7mg of Wild Rosehip. No other ingredient or additive of any kind.